Just because DS is almost dead doesn't mean you should throw it away. On the contrary. Now that Nintendo's 3DS is $169.99, thousands of gamers will flood stores looking to pick up the relatively inexpensive handheld. Some, of course, will look to trade their DS systems for cash and/or credit. Hey, it's a part of life. Old pieces of technology must eventually give way to the new. That said, we've had a tough time letting go, and for good reason. The DS has one heck of a library. The machine also gave us hundreds of happy memories, from late night bouts of Tetris DS to rescuing the princess in New Super Mario Bros.
With this in mind, we put together a list of reasons why holding onto your DS is a smart idea. 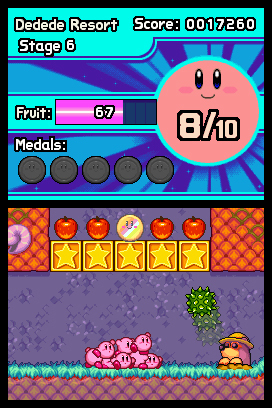 Kirby Mass Attack should be another fine addition to the DS library. Unless you're a 3DS Ambassador, there's no telling when (or if) you'll be able to download and play Game Boy Advance titles on the system. The old DS Lite, meanwhile, is backwards compatible with GBA, via the cartridge slot underneath the touch screen, so if you own one of these babies (and love GBA), leave it be. 3DS has a cool top screen, but DS games look best on DSi XL, thanks to two 4.2-inch LCD beauties. It's tough to play on anything else. Perhaps you don't want 3DS at all and need the extra dough. To that we say, hold on a second. DS still has some life. Over the next few months, it'll play host to Dragon Quest Monsters: Joker 2, Kirby Mass Attack, Super Fossil Fighters and Aliens: Infestation. Kirby, in particular, should be the sweetest of the four. Get rid of the DS now, and you'll kick yourself later. With DS slowly approaching the end of the line, retailers will begin slashing prices to its enormous catalogue of games, which means you'll be able to score some of the greatest hits on the cheap.